So I've been crazy busy with work travel and finally goodness. It is just as well as I, like the rest of the world, am trying to wait patiently for 6th edition. The rumors are a bit torturing, but it looks like we are finally getting some real rule information flowing in the last 24 hours as independent game stores get their store book. There are still a lot of bits I'm trying to flush out before I make big conclusions about how this affects the armies I play. Like do the BA Glaives count as a AP3 or AP2 weapon? Does Ghaz's waagh make the fleet an auto 12" roll on the charge? Because some of these become a big deal. As it is I'm trying to piece together how some of these rule changes are going to affect the effectiveness of the current builds. Of course getting an actual book in hand this weekend will help, but certainly it is going to take playing games to figure this out for sure. In the meantime I've tried to keep busy with other things. I've been getting in some xbox time which is nice to just zone out a bit. Frankie came over weekend before last for a few game of practice before he headed out for wargames con. He brought his 2k DE and we played 3 games. My Imperial Fists barely eeked a win out, my orks managed to also squeek a win, and he tabled my jumper BA. I didn't take pictures mostly because I had forgotten my table stuff at the office. 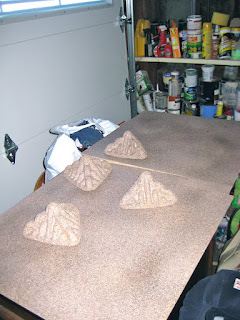 So I had the 'table' and my orks walls and one building. We basically filled in the rest with Thomas the tank toy buildings from my sons collection. It was both hilarious and totally sad. So that go me motivated to get another table setup and terrain to keep at home. I had already picked up the 'boards' for the table, so I just needed to get cracking. I decided I wanted to do a bit of a desert type of table. So when I went to home depot to get some supplies I saw these and thought I would give them a go. I was going to just use spray paint anyway to add some layers, but I figured theses would give just a bit more depth and texture. They actually worked out great. There is just enough texture on the boards but they still feel 'flat' so models will sit well. These are 2x2 segments of board, and I also had kept these card board bits that kind looked like pyramids so I hit those up as well and now there is some LOS action. I also have had this wreck terrain just sitting around unpainted forever. I figured I could hit that up quick with spray color primer and a few details and apply the shade. I also hit a few of the Imperial Fists I had gotten ready for that step. So I'll finish up the crash bits with some sand to get it to blend in and hit it with the dullcoate. I have some of the GF9 terrain incoming (oasis, dessert palm trees, and some red crystals just to get some color on the board). I'll probably wait until I get that all on the board before deciding if I need to do more. I had thought about making some plateaus to get some raised areas but it might not be necessary. I also thought about adding spots of static grass to get some more color on the board but... again I might as well wait to see how things look. Pretty much this is a nice little project to work on as I wait to get 6th ed games in because I'm sure once that happens I'll be busy tearing apart old armies and trying to build them for the new edition.